Provide comfort for the family of Pauline Syrko with a meaningful gesture of sympathy. Pauline M Syrko, age 89, of Donora, PA, passed away peacefully on Friday, January 18, 2019, at her home with her loving family at her side. She was born July 9, 1929 in Monessen, PA the daughter of the late John and Sophia (Kenes) Turanin. 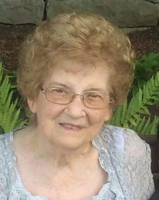 Pauline (affectionately known as Baba to many) was a member of St. Michael Byzantine Catholic Church in Donora, where she was a member of the church choir which was special to her since her youth, Ladies Club and the Cana Sodality both of St. Michael Church . She was employed at Sears Roebuck & Co. and then at Bucks Garage of Webster. One of her greatest joys was spending time with her family and cooking Sunday dinner. She loved taking photographs of the many family events. (Sorry Barry and Sandi about your wedding pictures! Mom made me). Pauline liked to listen to Polka music on Sunday mornings with Joe. She would frequently tape masses and choir music which she would use to bring joy to others. In addition to her parents, Pauline was preceded in death by her husband, Joseph C. Syrko Jr.; father and mother in law, Joseph C. and Mary (Buck) Syrko; sisters Sophie (Harry) Markinack, Ann (Timothy) Donahoe, Madeline (Charles) Reppert and two infant sisters Mary and Mary; a brother John G. Turanin; and a special friend David Haworth. Survivors include her son, David J. (Donna Coleman) Syrko,of Donora, PA; daughter, Linda A. (Jeffrey) Koceski of Monongahela, PA; daughter-in- law Kimberly J. Syrko of Donora, 6 grandchildren, David J. (Felicia) Syrko Jr., Stephanie (Jeremy) Layne, Joseph W. ( Paula Fugazzotto) Syrko, Matthew (Jamie) Koceski, Ryan and Caitlin Koceski; 4 great grandchildren, Leif and Alexis Syrko and Logan and Lucas Koceski; a sister, Irene ( Edward-deceased )Wigginton of TX; two brothers, Michael (Nancy) Turanin of NJ and William Turanin of FL; 2 sisters-in-law, Pauline D. Koval and Rose Turanin; also many special nieces and nephews. Arrangements have been entrusted to the Anthony L. Massafra Funeral Home and Cremation Service, Inc., 40 Second Street Extension, Donora, PA 15033 (724) 379-6900 where the family will receive friends from 2:00 PM to 4:00 PM, and from 6:00 PM to 8:00 PM, Monday, January 21, 2019. A Panachida Service will be held in the funeral home on Tuesday January 22, 2019 at 12 Noon followed by a Funeral Liturgy at 12:30 PM at St. Michael Byzantine Rite Catholic Church with Rev. Fr. Stephen Wahal celebrating. To send flowers in memory of Pauline M Syrko, please visit our Heartfelt Sympathies Store. Provide comfort for the family of Pauline M Syrko by sending flowers. "MEMORY ETERNAL" "MAY SHE REST IN PEACE WITH THE LORD" RESPECTFULLY. FRANK O. GORASH III & SON,TYLER MICHAEL HERK GORASH. My condolences to all of you. Pauline was such a special person and I along with many will miss her. My sincere condolences and prayers to you. Pauline was a great friend to Nuggets and my mother. May God bless your family at this time and may Pauline rest in peace free of pain and reunited with so many loved ones. My condolences to the family. Continue to let your fond memories of Pauline warm your hearts as you await the fulfillment of God’s promise to resurrect our loved ones. John 5:28, 29.